Seven Edgecombe Community College Career and College Readiness (CCR) students recently completed an Introduction to Advanced Manufacturing course. From left are Jerry Harper, CCR director; Harold Lynch, CCR instructor; graduates Sheila Hobson, Tony Battle, Willie Hooper Jr., Marqua Shaw, Chandra Goodman, Terry Dawkins, and Dari Johnson; Toby Lynch, plant manager at ABB in Pinetops; and Calvin Balance, Rocky Mount OIC’s chief business development officer. A local non-profit and industry recently partnered with Edgecombe Community College to equip College and Career Readiness (CCR) students with skills in manufacturing. The College’s CCR program (formerly known as Basic Skills), Rocky Mount OIC, and ABB in Pinetops merged resources to offer students with barriers to employment an eight-week Introduction to Advanced Manufacturing course. CCR Instructor Harold Lynch led classroom instruction in basic advanced manufacturing processes and interpersonal skills needed for employment. Hands-on warehouse training familiarized students with forklift operation, torque wrench settings, and business fundamentals. This training was facilitated by Calvin Balance, OIC’s chief business development officer. Students attained credentials in OSHA 10 Safety Certification and Forklift Operator Certification, and also earned Workkeys Career Readiness Certification. 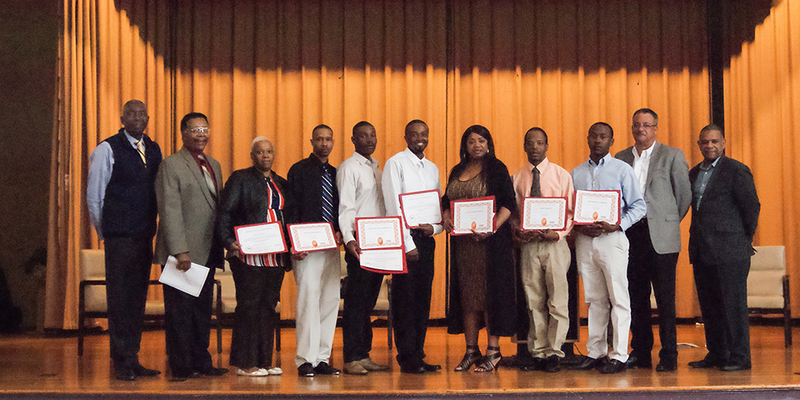 Additionally, these graduates were provided an opportunity to interview for employment at Cummins Rocky Mount Engine Plant. This initiative falls under the Workforce Innovations and Opportunities Act (WIOA), legislation that is designed to strengthen our nation’s workforce and help Americans, including youth and those with significant barriers to employment, obtain high-quality jobs, and also enable employers to hire and retain skilled workers. During the Introduction to Advanced Manufacturing program completion ceremony, Toby Lynch, plant manager at ABB, encouraged the graduates to stay the course and to continue to learn and strengthen their skills. A second cohort of CCR students will begin a similar IET initiative in the coming weeks.